If you’ve been around here for awhile, you know that I’m a big fanatic about smoothies… green maca smoothie, detox smoothie, eggnog smoothie… I’ll drink them all. They’ve been my staple go-to breakfast for several years now and I even wrote a book about how to make them high protein without using processed protein powder (yuck!). Making smoothies is a lot like riding a bike – once you know how, you can’t ever forget. But what if you’ve never made a smoothie before? That’s why today I’m showing you how to make my favorite basic green smoothie recipe! Before I jump in, it’s important to understand that you don’t NEED an actual recipe to make a good smoothie. You really need a basic framework and you need to experiment. 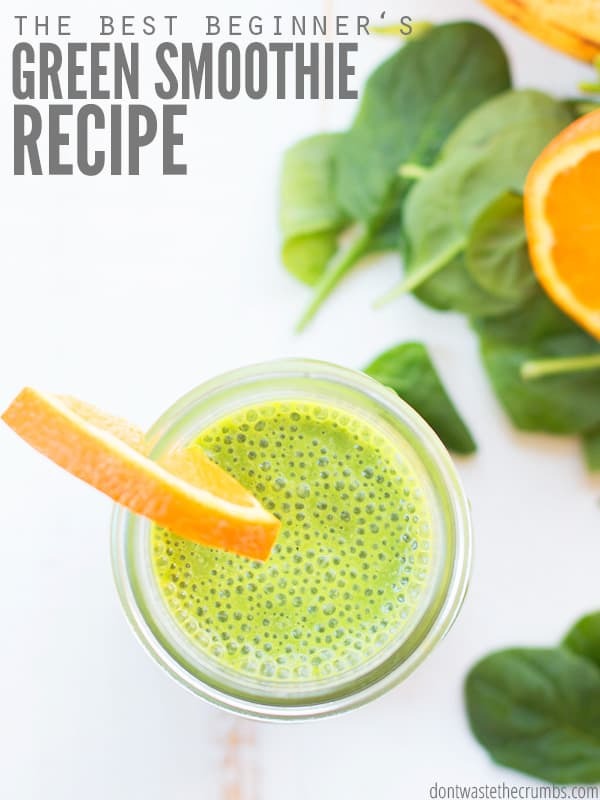 So with that in mind, let me show you how to make a green smoothie that tastes amazing! You always start with a liquid base. You must, must, MUST add some sort of liquid to your smoothie otherwise it won’t be thin enough to drink. There’s no way around it. Your liquid can be water, but most recipes call for some sort of milk (regular, almond milk, rice milk, etc.) because it helps to make the smoothie creamier. I personally also think it bridges the flavor between the other ingredients better. I’ve tested several smoothie recipes, making one version with water and one version with almond milk. The almond milk versions always taste better. To me, when you make smoothies with water, you can taste each individual ingredient in the smoothie. It’s not a “bad” thing per se, but I think smoothies taste a lot better when you can taste everything together. For example, lately I’ve been making a blend using pineapple + banana + avocado + vanilla protein powder (from Young Living and junk-free). I tested it with water and it was so-so. Nothing to write home about. 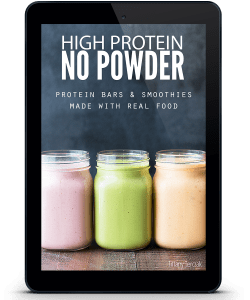 Note: If you’re following a certain diet – whether it’s keto or low carb or high protein – and you want your smoothies to align with your goals, I highly recommend using the charts in my book High Protein No Powder. I included 12 different liquid bases with various calorie, protein, fat and carbohydrate content so you can mix/match based on your personal dietary needs. You need a creamy factor. Ever wonder why most smoothies have bananas? It’s because they make smoothies creamy. 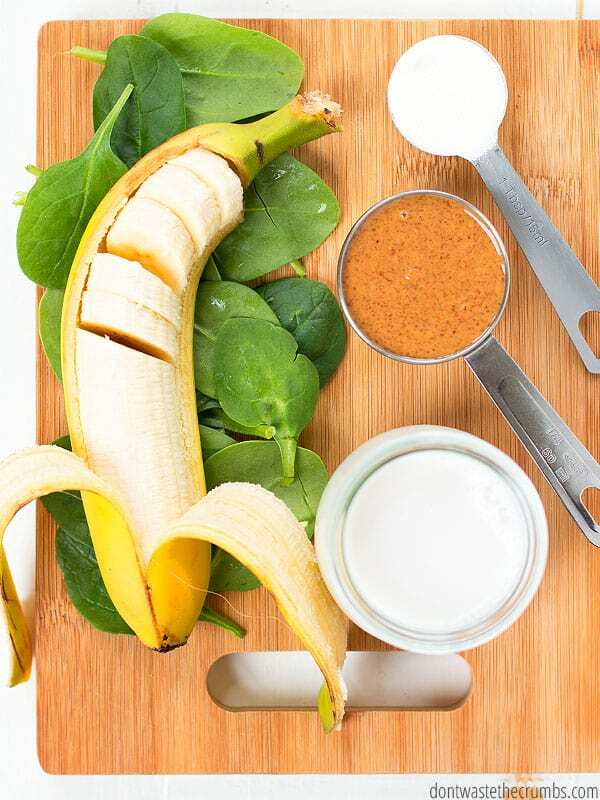 Bananas are naturally sweet, which help to balance out the overall flavors in a smoothie. 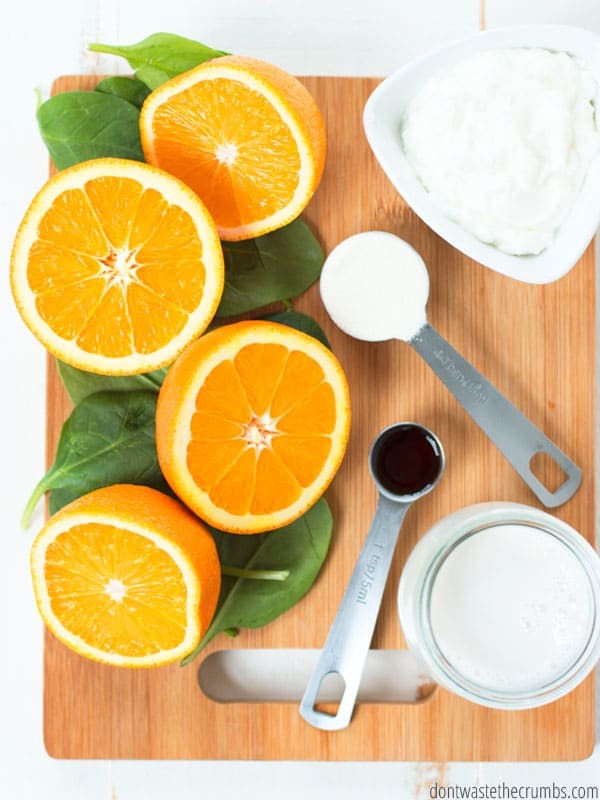 Plus when you use fruit that is naturally sweet, you can get away with adding more vegetables or greens without taking away from the flavor of the smoothie. Bananas aren’t the only creamy factor – mangos and avocados and pears are among some of the others – but they are the most readily available, the most affordable and honestly, I’ve never tasted a smoothie with a banana that tasted bad. If you’re a beginner, I highly recommend using bananas in your smoothies. If you don’t like the flavor of bananas, try using green bananas instead of ripe bananas. The banana flavor is very mild. They’re not as sweet as a fully ripe banana, but they still take care of the creamy factor. If you’re allergic to bananas, I created a list of 10 other ingredients that will work as a creamy factor in my book. A word to the wise: if you pick something that has a strong flavor, you don’t need very much! If you want to make any green smoothie recipes, you need greens! If you’re new to green smoothies, start with spinach. It’s very mild in flavor so you can add some to any smoothie and not even notice the difference (other than the color change!). I recommend starting out with just ½ packed cup at first. 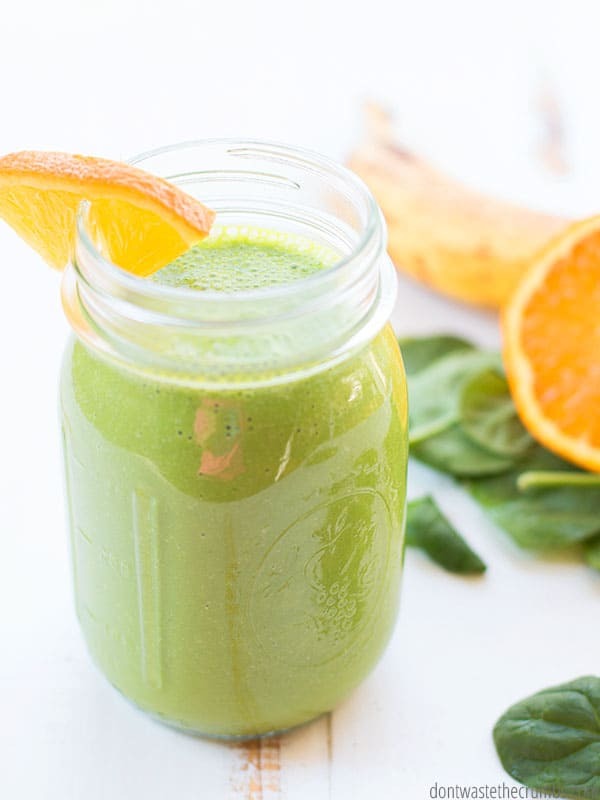 I know this doesn’t sound like much, but I would much rather you add a little spinach and love your smoothie and make more, than add a lot of spinach and hate your smoothie and never make another one again. You can always increase the amount of spinach you add to your smoothies over time, and in fact, I recommend you do that! Once your brain understands that spinach in a smoothie isn’t a weird thing, you can add up to 2 cups – sometimes more! – without blinking an eye. I personally add about 1 ½ packed cups of spinach to all of my smoothies, which is about two large handfuls. That’s my personal sweet spot! A smoothie should be flavorful and fun! Once you have a liquid base, a creamy factor and a handful of green, then you can have fun with flavors! Strawberry key lime pie? Blueberry cheesecake? Chocolate covered bananas? Peanut butter cups? Pick flavors that are in season. Not only will they taste better, but they’ll be cheaper too! A little bit goes a long way. Start with ½ cup of two different flavors and go from there. You can always add more of one or the other, but you can’t take it back out. Use nuts and nut butters in moderation. Really, one to two tablespoons are plenty in a smoothie. Use simple, tried and true combinations. Mixed berries. Peanut butter + banana. Strawberries + banana. 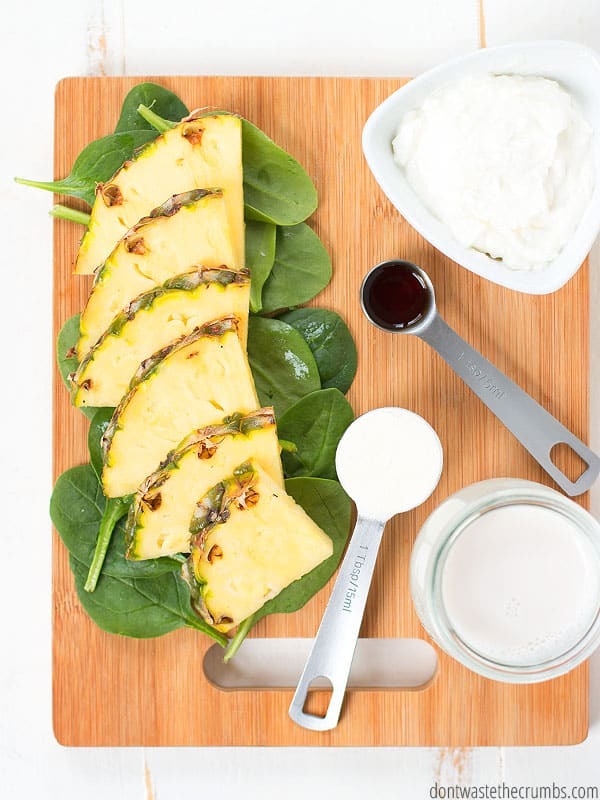 Pineapple + mango. Kiwi + green grapes. You can also boost the flavor of your smoothies with extracts, 100% pure essential oils and spices from your spice cabinet too. A few of the recipes in my book High Protein No Powder are of the “plain Jane” variety, but some of them are pretty inventive… raspberry lemonade, peach + blueberry, cinnamon bun, cinnamon persimmon and blueberry cobbler are just a few of my favorites. Don’t worry about them tasting good though – every recipe went through an independent panel of taste testers! Sometimes ingredients can pull double duty. Milk kefir is fermented yogurt and incredibly nutritious, and it serves as both the liquid base and creamy factor. Fruit that has a lot of natural juices, like pineapple and oranges, can offer both flavor AND contribute to the liquid base as well. Avoid added sweeteners if possible. The whole point of making a green smoothie is because they’re healthy, right? So let’s not PLAN to add honey or dates or any other sweetener – natural or not. There’s really no need! 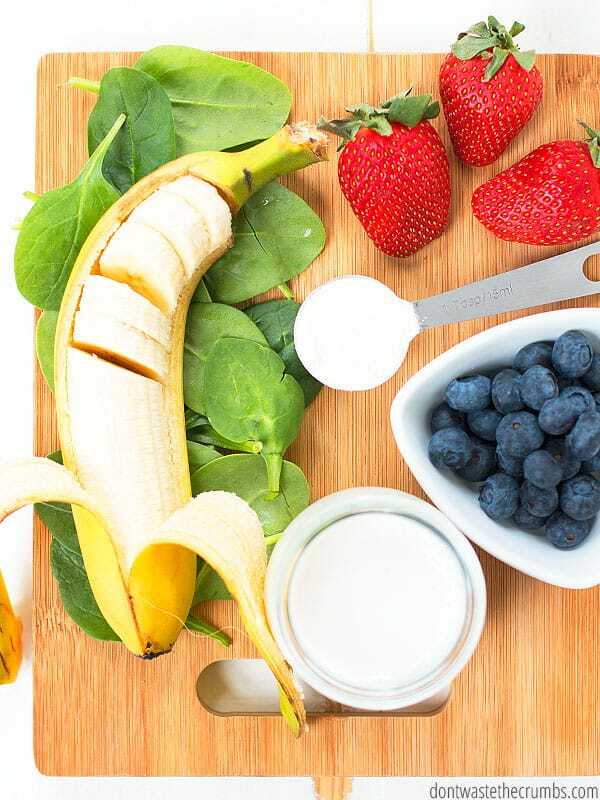 If you don’t think your smoothie is sweet enough, then change the fruit you’re using or add more banana or add less spinach. Your taste buds will change over time, but adding sweetener won’t help the long term goal of eating healthier. Hands down, cold smoothies are WAAAY better than warm ones, but ice cubes doesn’t help the overall flavor of the smoothie. In my opinion, ice cubes also make smoothies feel more like slushies – they’re icy, not creamy. If you really want cold smoothies, freeze the fruit ahead of time. I recommend freezing the bananas because they’re one of the staples in my own smoothies, but you can also make almond milk ice cubes or freeze berries as well. We can’t talk about green smoothie recipes without talking about blenders, can we? I have a Blendtec Classic. My husband bought it for me as a birthday gift several years ago. We’ve since added multiple jars (this Twister Jar and the Wildside Jar) to our collection and we don’t regret the purchase in the least bit. Yes, it’s pricey up front, but when you use it on a daily basis – sometimes twice – you need it to work and to work well. Blend the liquid + greens until they’re all blended up. No chunks. Then add the creamy factor and blend. Finally, add whatever flavor and fun is left and blend until smooth. Do you know how I got started making smoothies in the first place? Because my kids would take two bites out of an apple or eat only part of their banana and I didn’t want that food to go to waste! 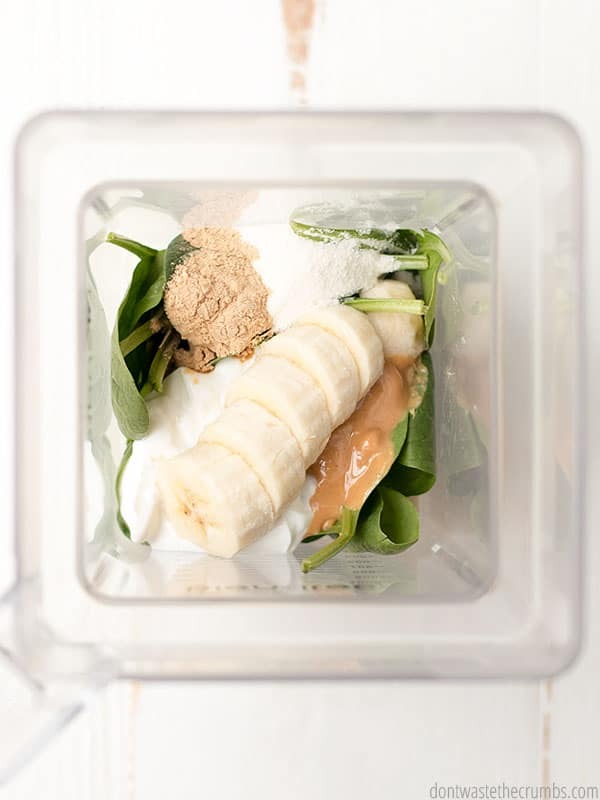 My desire to eat well on a budget led me to make smoothies a priority, and being intentional with my health taught me how to make protein smoothies without protein powder. Even now when I have a bit of leftover cottage cheese or white beans or even oatmeal from breakfast, I know how to take these nutritionally dense foods and turn them into a smoothie that even my picky eater loves thanks to the 29 smoothie recipes and step-by-step guide in my eBook, High Protein No Powder! Do you know how to make green smoothies recipes? What’s your favorite green smoothie combination? Leave your ideas and suggestions in the comments below! Chili Lime Shrimp Wraps for Light and Fresh Clean Eating!